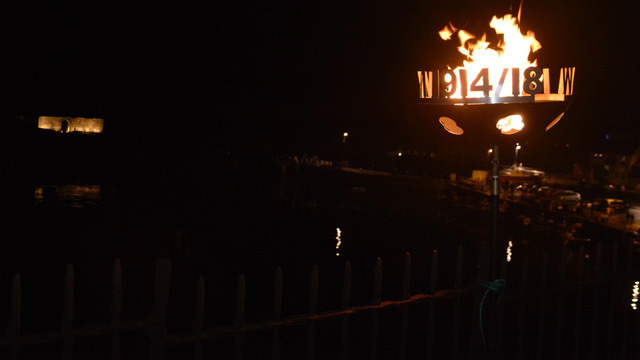 Sunday 11th Nov: Remembrance Day and Lighting of the Beacon. 6.20pm. Dunbar Pipe Band marched from the Royal British Legion down Victoria Street, across the harbour bridge to Dunbar Battery. 6.30pm. The atmospherically-lit Dunbar Battery was packed as the Battery Theatre Company entertained the audience. Sharing of Stories – Stories of the men of Dunbar who went to War. 6.55pm A lone piper, Pipe Major Alex McCrorie, played the lament : Flowers of the Forest and a bugler played ‘The Last Post’. 7.00pm Lighting of the Beacon on top of the castle, by George Easingwood. This was one of a thousand beacons lit across the country for the centenary of the signing of the Armistice which heralded the end of the Great War. Dunbar Sea Cadets lent their support to this and many other events over the weekend. Also many thanks to the Harbour Trust who helped to ensure the success of this event plus several volunteers.